and making evil scientists rich tycoons. Anyone born with any type of disfigurement would have their fate automatically led in the direction of becoming a slave to their masters named "Igors", and are typecast as being foolish, slurring, and stupid. However, one particular Igor (John Cusack), tired of the mistreatment and tereotyping against him, is actually scientifically intelligent, despite being shunned by his own master, Dr. Glickenstein (John Cleese). Behind his master's back, he has brought a sarcastic rabbit named Scamper (Steve Buscemi) back to life from having been run over and making him immortal. He also transports a brain that formerly belonged to a man named Brian into a life-support robot, named Brain (Sean Hayes). finger of this monster. Only, when he brings her to life, he discovers the giant is completely gentle, polite and affectionate. When explaining how she's supposed to act, the giant (Molly Shannon) mispronounces the word "evil" and converts it to "Eva", which becomes her name. Igor surmises that the Evil Bone had not activated properly, and immediately brings Eva to the "Brain-Wash" to correct this by making her watch violent acts of horror on television. Brain absentmindedly changes the channel in the midst of the treatment, and causes Eva to adapt the personality of a kind Hollywood actress. Igor uses this to his advantage by telling her that the Fair is an audition for the role of Annie in the famous musical, and she agrees to obey him at last. 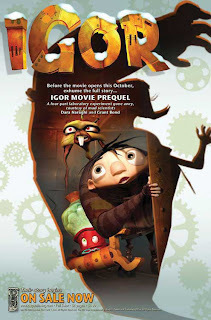 While preparing for her role, Eva becomes close friends with Igor, and supports him in his goal of becoming different. and his slave's invention. He first tries to take the creation by force during a carriage chase through the backroads, which fails. He then talks to Igor in person during a civil visit to his own laboratory, and offers him a deal: give him Eva as his creation for the Fair, and become the richest evil scientist instead. Igor discovers his true intent, and he narrowly escapes. Through time, Igor feels like his emotions toward Eva have overshadowed his own intentions, and tries to shake himself out of it. While on the balcony, Dr. Glickenstein's former assistant, Heidi, pays a visit. Eva spies them through the window, and approaches Heidi to ask what is going on. Heidi admits she has fallen for Igor during his self-transformation, and mentions what he would do with someone as ugly as her, which puts Eva's opinion of herself in question. The night before the Fair, she sees Igor in a kiss with Heidi, which is revealed to be Dr.
Schadenfreude's girlfriend, Jaclyn (Jennifer Coolidge), in disguise. Igor is arrested by the King, who also found out about the cover-up, and throws Igor into the "Igor Disposal". Eva is then approached by Dr. Schadenfreude, who draws her into giving up Igor's apparent lies and come with him. He reactivates her Evil Bone by pushing her into committing her first act of evil (throwing him backward), which transforms her into a growling monster. Scamper and Brain follow Igor into the Disposal, and free him. All three rush toward the Fair to save Eva. While sneaking around, Igor discovers that the dark weather Malaria has had for years was the result of a weather-controlling machine built into the King's home and the Fairgrounds, which means that the King had actually orchestrated this whole evil-invention industry himself. Igor rushes into the arena where the inventions are all fighting, including a deranged Eva, and tells her that everyone has an Evil Bone inside them, but it is up to that person to choose whether or not to use it. Eva regains her sanity, and forgives him. Scamper and Brain deactivate the weather device, shining the sun back over Malaria, and exposing the King as a fraud. For his heroism, Igor is soon dubbed the new King. Dr. Schadenfreude takes the throne for a brief few minutes, until he is also stripped of his occupation and respect. The Fair is changed to an annual musical theater showcase, with Eva as the centerpiece of the first event, and all Igors are now seen as equals to everyone else.